The Theme Building at LAX ca. 1960 and Paul R. Williams, one of the designers. Went back to Los Angeles last week for a business conference. Greeting me was the striking mid-century modern Theme Building at Los Angeles International Airport, newly restored. 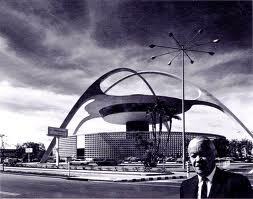 The futuristic structure was designed in 1959 to give Angelenos a sense of unbridled optimism. It inspired the cartoon sky-buildings in The Jetsons. When I was a child my father, a space scientist, traveled often for work to D.C. Every time we went to pick him up from the airport I'd gaze with wonder at that white and blue spaceship with legs like the Martian invader ships in War of the Worlds. My childhood was all about space travel, the outer realms of imagination and the future. I grew up in the 1960s, a time brimming with a sense of change and possibility. We never missed seeing Star Trek, Outer Limits, One Step Beyond and Twilight Zone. I loved the works of Heinlein, Asimov, Clarke and Bradbury. I carefully pasted news clippings of the first moon landing in a scrapbook and the family together watched men walk on the moon with overwhelming pride. Nothing was impossible. I truly believed that humans would live on other planets in my lifetime. My father nurtured that sense of embracing the future and readied us by giving us math problems to solve, instilling in us a love of literature and music, and also a sense of duty to him and my mother. In his spare time he built complex abstract modern sculptures of wood and steel in sinuous, twisting shapes. He came from India as a graduate student, met a beautiful, perceptive woman from Korea, had five children, moved to a big house with a swimming pool in the suburbs of Los Angeles, and lived, as so many Americans still do, on the edge of his means. But when I landed in Los Angeles last week, I gazed on the Theme Building with a sense of melancholy. It had been over 35 years since I lived in L.A. Sure, the spaceship structure looked shiny and new after millions of dollars of restoration, but its promise of the future looked dated -- a retro kind of impotence. The well-worn freeways taking me from the airport were all too familiar. No Jetsons hovercraft here, not even high-speed rail, just miles and miles of concrete, as far as the eye could see. And my childhood home? Thank you, but I prefer not to visit. No one I know is home. The sixties gave way to the seventies. Escalating costs of the Vietnam War drew funding away from the space program, and my father was out of a job. Divorce and bankruptcy soon followed. I recall combing the LA Times classifieds as a young teen for a first-ever job for my mom, who became a salesclerk at a high-end clothing store. 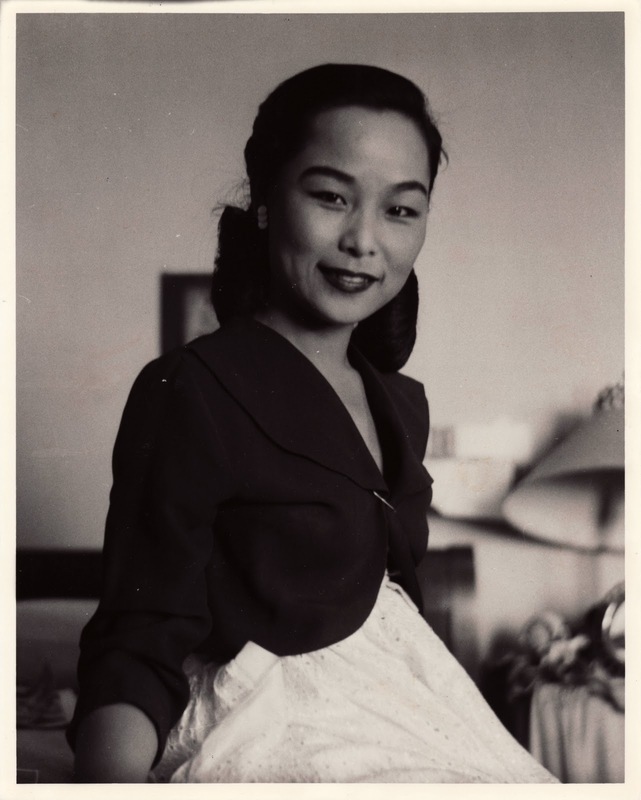 I also recall accompanying my father, who was always meticulously dressed and groomed, to the Federal Building on Wilshire Boulevard to pick up his mail and unemployment check. We didn't know if the space program would flourish again. All we knew was that my father, a rocket scientist, could not find work. 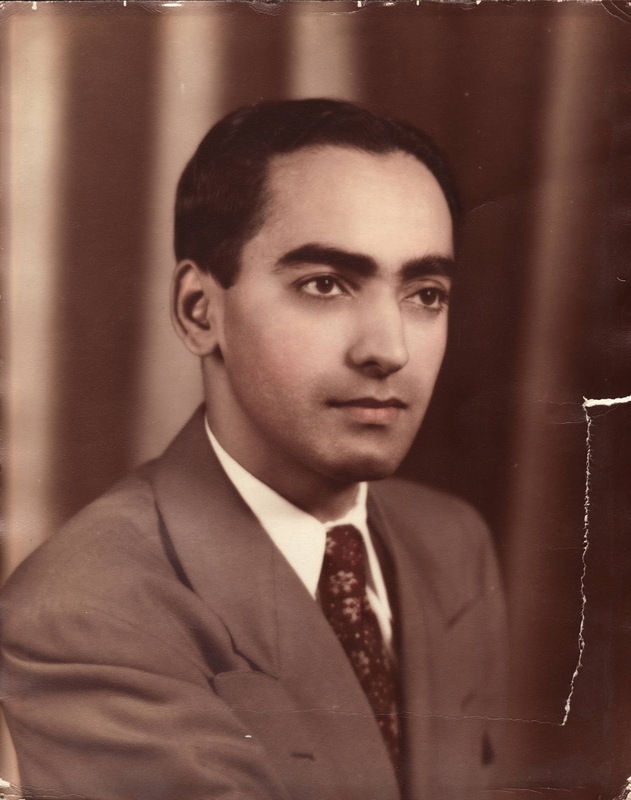 And then, on the very day that the nation held its breath as Nixon resigned, my father, at the age of 50 -- in a serene act of what he believed was Hindu devotion, and because he thought he was worth more dead to his family than alive -- took his life. It was August 9th, 1974, the day that the future darkened and changed course. I was sixteen. I left Los Angeles a year later for college and a lifetime of grappling with a deep, hidden sorrow. My father left me with a final problem that could not be solved. Today, the advances in science and technology would have delighted my father, not to mention the new Star Trek movie. While his tragic, final act has haunted me to this day, it also pushed me to make the most of my one life. I put myself through college and graduate schools, collected an array of degrees, found a wonderful husband late in life who respects me and makes me laugh every day, a dog who respects me some of the time and gives me unconditional love, and a dream job that keeps my mind sharp and spirits high. It's a happiness that focuses on day-to-day challenges and joys rather than on far-off galaxies. Would I have achieved all this if my father had lived? I don't know. All I know is that I did not care to linger in Los Angeles last week. Too much sorrow was embedded in those freeways and swelled in the ever-returning waves of the Pacific Ocean. I caught the first flight I could out of LAX after the conference and hurried home. My father and mother, taken soon after they met in Chicago in the late 1940s. Gorgeous, sad and ultimately honoring of the life your father lived and the final choice he made. Generous to us as well. Thank you. This is a beautiful, sad post. I remember the Los Angeles you describe, living there at the same time and age. We really did think it was all about tomorrow in the 60s. Thank you for gracing us with the story of your father. I don't know what to say. I can only imagine how difficult it must have been to write but what an amazing tribute to your father. And what a handsome couple. Very touching and interesting! Thanks for sharing that. Now I see where your interest in science comes from. This is such a beautiful piece. Thank you for writing it. I personally know how loss can sometimes make us do wonderful things. Generous is a good way to describe what you have written. I remember the sense in the 60s that we could, and would, colonize space. I miss that spirit, but I definitely did not see it end the way you did. This post must have been excruciating to write. A lovely, detailed, sensitive story. Thank you for sharing it. Discovered this via Roger Ebert, so brace yourself for the "Ebert Effect," whereby many more people will be reading this entry than normal. Magnificent. Thank you for this, and for giving shape to something so profound and boundless. A beautiful piece of writing, thank you for sharing it. You have captured so eloquently the sense of loss I feel about the hopes we 60s kiddies harboured. I saw that building at LAX, on a visit to America from Australia in the late 1970s. It was so evocative of what felt like an already fading moment of American modernism. We're the same vintage you and I, and I also lost my father, to cancer, when I was 14. I am so sorry for your loss, in such circumstances. Your parents sounded like extraordinary people, their daughter clear proof of that. Beautiful and poignant...so difficult to go back to one of the most painful times in your life. Thank you for sharing. Thanks for this - it puts my own childhood, and my dad's early death, in a perspective I need to keep in mind every day. The enthusiastic optimist in you I've gotten to know on-line is all the more impressive to me for reading this. Thank you so much for sharing. You look exactly like the child of your Mom and Dad. I'm glad you wrote this. As I look at some family history, I wonder how (and what) we tag from our past as having significance or being causal. I think this is a profoundly beautiful piece of blogging. I have read it twice and I will read it again. Genuinely moving and beautifully written piece. Thank you! What beautiful brave people. An honor to read. Thank you. In an earlier incarnation of yourself, some of this was difficult, I thought, for you to discuss. I'm glad you are willing share this poignant account. I'm sorry you lost your dad so young. We, the daughters of industry around these parts during the 60s-70s, recall the frenetic energy and post atomic-style cultural influence of Southern California aerospace. You've created a blogiful time capsule. Yet, I'm so haunted by the story of self-sacrifice. So... I'm completely late here but this was brilliant and sad and brilliant! Thank you so much for sharing this, I hope you come back here soon and give me something else to read -- now that I found you and all.